Forges can be used for a variety of applications including metal bending, metal forging, occasional heat treating, metal forming and sharpening, preheating and stress relief of weldments. The forge body is made of heavy gauge steel construction with cast iron burner manifold and special steel tie-rod reinforcement. 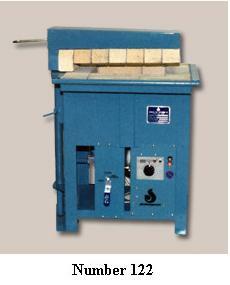 Fire boxes are heavily insulated and super duty hard-burned firebrick is used on all wearing surfaces. Gas and air adjustments are convenient to the operator. Johnson Forge Furnaces come complete with quiet, powerful Johnson Blower, swinging adjustable refractory lid, adjustable front tool rack for supporting pieces, solenoid safety valve that shuts off gas when blowers are turned off, and exclusive Johnson Automatic Spark Ignition System. The need for matches is eliminated. Press a button and the furnace light automatically. 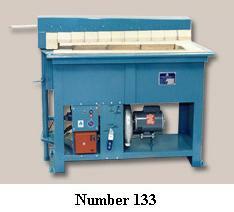 Model No.133 is equipped with four burners (end burners may be turned off for smaller jobs when desired). The No.122 has two burners. Additional Furnace sizes available on request. L W D L W H No. Pipe Size BTU/hr. Lbs.